Bowler Robbie Joseph says he owes Kent captain Rob Key after the batsman was instrumental in him rejoining the county last week. Joseph did not play any first-class cricket in 2013 but he took three wickets on the first day of the season opener against Worcestershire. "Rob has always been a fan," Joseph, 32, told BBC Radio Kent. "I'm glad to be able to prove his faith in me is not without cause. I'm happy to have repaid that trust." 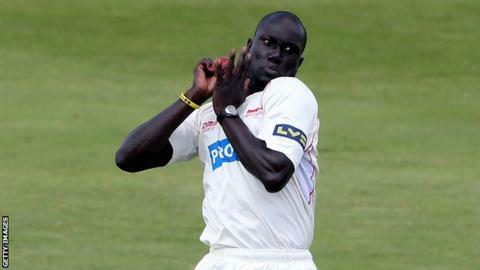 Joseph made his debut for Kent in 2005 and took 144 first-class wickets at an average of 31.25 during his first spell with the club, before leaving at the end of the 2011 campaign for Leicestershire. The Antigua-born paceman was dogged by a shoulder injury towards end of his first spell at Canterbury. Joseph trained with Kent last year but did not feature for the club. "Unfortunately it didn't really come to anything," he said. "I said to Jimmy [Adams, Kent coach] that I would be playing in Cape Town and if there was any interest to let me know. "When Rob Key was made captain I had a conversation with Jimmy and spoke to Rob from over there and came back for pre-season. "There was always the worry you may not get another chance. I just had to back myself and my ability." Joseph was delighted to contribute at New Road in what is Kent's opening match of the County Championship Division Two campaign. "It's good to be back playing cricket and doing what I love," he said. "I couldn't have asked for a better start. "Like anything you are a little bit nervous and want to be doing what the team requires."